Alison in Aotearoa/ New Zealand: The "Engle" Has Landed! The long awaited arrival of the Engle family has finally come! Auckland welcomed them with cool temps and light rain, as per usual, but that didn't dampen their spirits. We are blessed to have this precious family as our newest missionaries on the district, teaching in the rural NZ town of Kaeo, 1.5 hours north of Whangarei, and serving with our local fellowship on the weekends. None could be more thrilled and relieved than Steve himself! He arrived here in country a month ago alone, ahead of his family, due to visa and employment complications, and has eagerly anticipated reunion with them since the day he left. The Engles have been trying to get to New Zealand for over two years now, but encountered many obstacles with immigration and the lack of available employment in the Northland . . .until now! 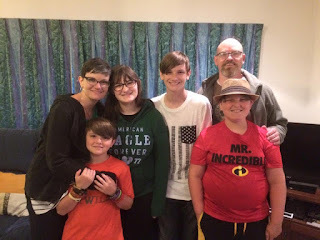 In his perfect timing and foreknowledge, God provided a teaching position for Steve at a very difficult high school up north, and now has opened the door for the rest of the family to join him. Finally, as my district superintendent Neville says, "The Engle has landed!" Please pray for Steve, Lori, Harrison, Hollister, Heidi, and Hadley as they acclimate to life on the other side of the planet! They hail from Tennessee, USA, and are in for a wild, yet rewarding ride! Support for Solo Mums Continues!